Hotel ibis Cologne Am Dom. Book your hotel in Cologne now! 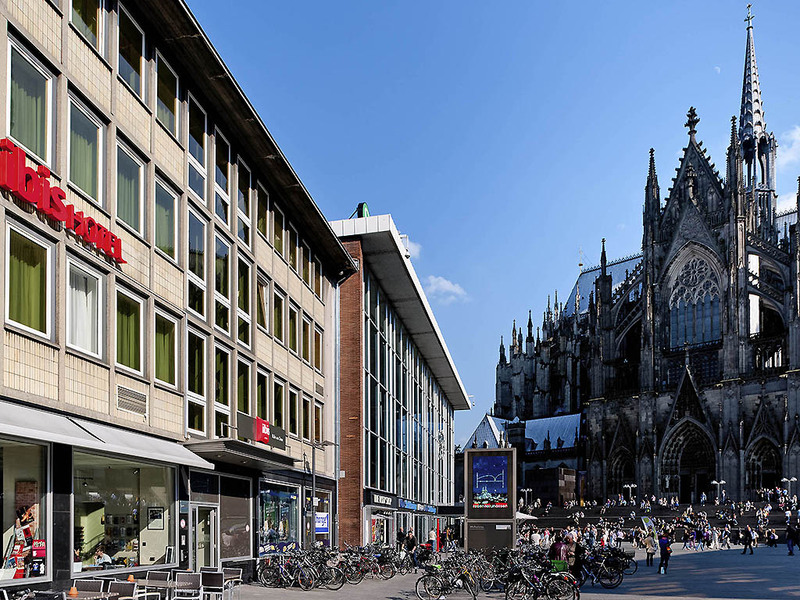 Disembark and feel at home: the ibis Hotel Köln am Dom is conveniently located at Cologne main train station, offering direct rail access! Thanks to its ideal location in the heart of the city, you can spend more time enjoying the activities Cologne has t o offer. All rooms have a view of Cologne Cathedral, which is a UNESCO World Heritage Site. You can enjoy our delicious breakfast with fresh waffles on the first floor, with a view of the cathedral; outside guests are welcome. All rooms have a view of Cologne Cathedral. Located right next to Cologne main train station. Schildergasse shopping street is just 2 minutes' walk away. Rhine River and historic old town with museums, restaurants and bars very nearby. Direct links to Cologne Bonn International Airport (15 minutes with the S-Bahn). The ibis Köln am Dom hotel has 71 extra-comfortable rooms featuring Sweet Bed by ibis beds for a good night's sleep guaranteed. Room amenities include free WIFI, a desk so that you can work in peace and TV with a wide range of Sky channels. If you don't manage to find time to enjoy a Kölsch beer while taking in the Rhine metropolis: You can get one at any time of day or night at our 24-hour bar. Snacks, crispy paninis and live sporting events on Sky are also available. Clean, friendly, and very comfortable. Excellent location to catch an early train. Great experience from the time we booked room until checkout. A unique 3 night stay for business & leisure travel ! I was very satisfied, especially with the location and the soundproof quality of the rooms, along with the substantial buffet of the breakfast offered. Really appreciated the astonishing view of the cathedral and of the Square. The city center and the Rhine River promenade all within a few steps away ! I enjoyed alot staying in your hotel , very close to Koln Messe Deutz. As the location is in the HBF so did not waste my time, just one stop by train to reach Koln Messe Deutz. It would be more comfortable if the smell of the toilette can be eliminated. If I entered the toilette afternoon just after cleaned, is ok, but every time I urinated, the smell stays all the time, and the more often I urinated the smell was getting more and more intense until the cleaning service clean the room. I am a woman, my urine not out of the closet bowl. It seems that there is something wrong with the construction of the closet or the piping. The location was paramount. Front counter service was okay... I have had better from other Ibis hotels around the world. The windows are not fully sound proof so you get a lot of noise from the square downstairs. Bathtub would flood to the ankle, I could not get the water to drain quick enough in the small shower. There were kinks here and there but all in all the location made up for it. Easy walkability to everywhere and you could not get lost even if you tried. Good value, central location, friendly staff and good breakfast. This hotel is located directly at the central station. The room is clean and relatively quiet. The staff was vervy kind and we could check in the room although it was 11:30. It’s was ok, service was satisfactory and room was clean and tidy. Excellent location, breakfast was good. IBIS Koeln Am Dom is a central placed hotel in Cologne in the same building as the main railway station which make it very convenient for traveling. I did stay one night for a connection with train the next morning. The reception clerk was very friendly and helpful. The room was clean and nice and a good breakfast was included in my booking. My all over experience was very good. A very convenient site of the hotel makes it so attractive! I liked the friendly atmosphere in this hotel. What I appreciate more is the fact that they allowed us to stay in the room after 12:00 to wait for our departure. That is great! Don't be put off by the fact that this hotel is part of Koln central station complex: you don't even need to go outside to access the hotel! All the rooms face out into a main square, really do have a view of the vast cathedral, and are well sound proofed - not a hint of a train! Clean room, comfortable beds and a good breakfast. The shower room was fairly small but well fitted. Clean, compact tidy modern room. For us this was good for a practical one night stay, and we would like to have stayed longer. Friendly staff and perfectly adequate breakfast with nice choices. Considering the busy location, this was peaceful, even with 500,000 people visiting the city centre outside for carnival while we were there ! Ibis has a good option for an overnight stay with location being prominent and close to Main station and city center. The breakfast was OK and the room for comfortable. Everything was fantastic and my request for a quiet room away from lifts etc was adhered to. It was ok but very basic. I asked for a kettle in reception to be told that it wasn’t possible to provide. Room was small but adequate.